NurturMe Power Blend Purees is organic gluten-free baby food. These tummy-friendly, super fruit and veggie meal pouches feature a nutrient-boosting tropical twist. Create healthier eating habits from the start with exotic new superfood combos that delight curious taste buds, are gentle on the tummy and support baby's growth naturally-the NurturMe way. Ages 6+ Months (Stage 2). Superfruits, Supergreens We believe that superfoods grow superkids. Taking the next step from cereals and simple purees to "real food" is stressful. Created to take the worry out of feeding your little one's growing appetite, NurturMe Power Blend Purees combine exotic tropical fruits like mango, guava and pineapple with nutrient-rich veggies. These tummy friendly pouches are free from common allergens that can upset sensitive little bellies-including gluten, dairy, soy and egg. 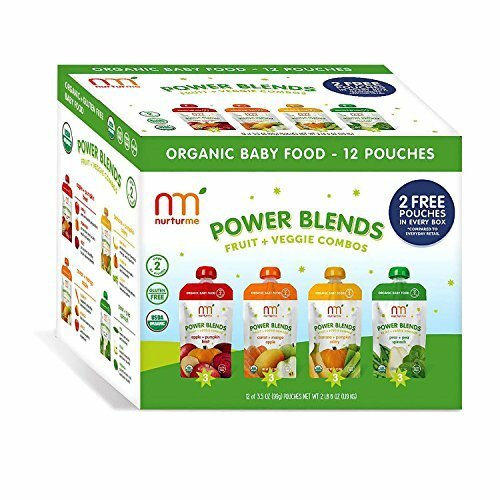 As nutritious as they are delicious, all four flavorful combos were designed to introduce exciting new flavors to your little one's palate while delivering the essential vitamins and minerals they need to grow big and strong. Now that's what we call super! If you have any questions about this product by NurturMe, contact us by completing and submitting the form below. If you are looking for a specif part number, please include it with your message.